The Samsung E820 is a close relative of the Samsung E800 and shares many of the same features, and is almost identical in size and weight. The E820 is identical in hardware terms to the E810. The E820 has a camera unit similar to that on the Samsung X600, and can store twice as many numbers as the E800. The E820 is tightly integrated into T-Mobiles t-zones service and is exclusive to T-Mobile. For other networks, consider the E810 or E800. This is a compact dual band GSM phone, with an unusual sliding arrangement. The E820 weighs just 86 grams and measures 87x44x24 mm. 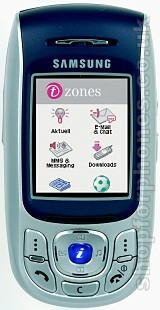 GPRS is supported on the E820, and Samsung have also given the phone Java support for games, polyphonic ringtones, WAP, MMS and a set of organiser applications. Available now on T-Mobile. Subscribe to our newsletter for updates.